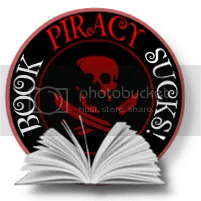 ← Time Lords reading Time Travel … what? Okay so here’s the first installment of my sharing my Ipsy Glam Bag with you. This month’s theme was Street Style. Now when I heard that I have to say I was a little weary, I mean I am so far away from street style it’s not even funny. I’m much more conservative when it comes to make-up, but hey I was waiting to see what I’d get. I was not disappointed. 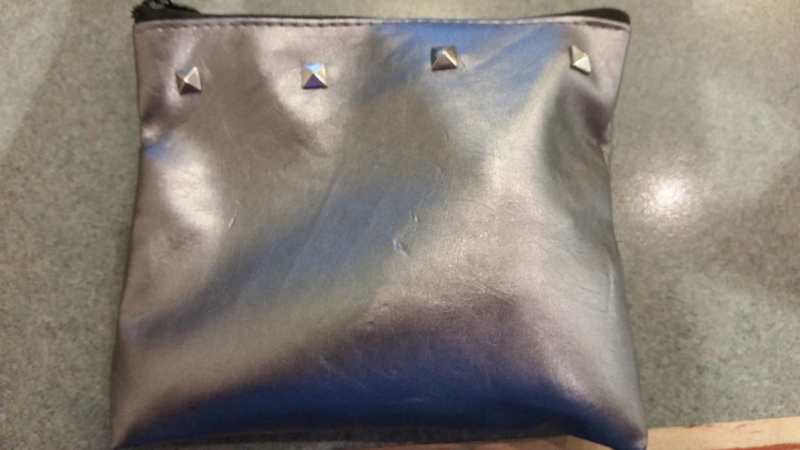 So here is a picture of this month’s glam bag – it’s studded, very street LOL. And it’s a pretty decent sized bag which I love. And I really like the steel gray color of it. All in all great first impression. Now here is the bag with all its goodies. Inside I found a NYX eyeshadow in Chandelier (Now I’m singing Sia – go ahead click the link I’ll wait until you listen too), Pacifica eyeliner in Fringe (which is like a brown color). This I may use as a lip liner, brow liner. Caiylin tinted lip gloss in Love Affair – rich red color, really nice. Briogeo Don’t Dispair, Repair! Deep conditioning mask for my hair (woot!) It’s a small container which I’m hoping will cover my mass of hair at least once LOL. And finally …. from Crownbrush.com, a crease/shadow brush for eyeshadow. The bristles on this are incredibly soft. So there you have it. If you’re interested in subscribing to Ipsy, it’s only $10 a month and you can use my link to join. Click here. 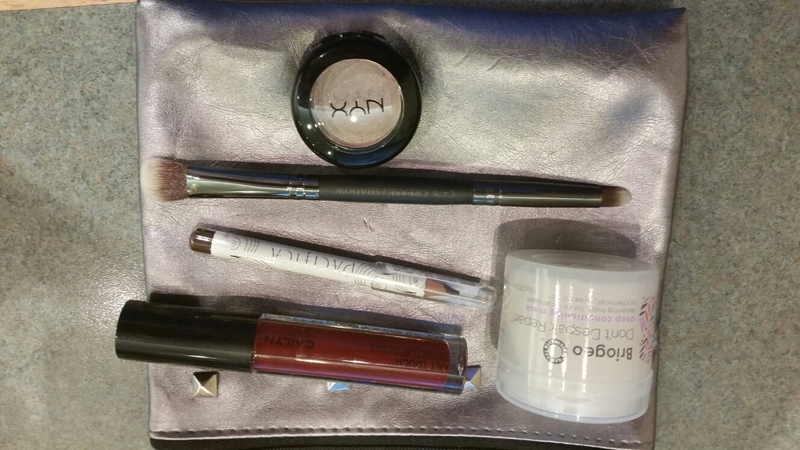 This entry was posted in Life, Random Ramblings, Webby Stuff and tagged Glam Bag, Ipsy, Sia. Bookmark the permalink.